Let Air Energy take care of your industrial hose requirements. We boast a vast compressed air hose range with a variety of products available for use in a multitude of industrial applications. Whether you need a hose for air or water, high or low-pressure use, or slow or fast transfers, Air Energy has the right product for you. We specialise in Polyurethane and PVC hoses, but we also provide PTFE (Teflon), anti-spatter, braided, non-braided and multi-bore polyurethane hoses. Our industrial hoses are built for high performance and cost savings. We offer hoses that are resistant to scorching, crimping or abrasion. 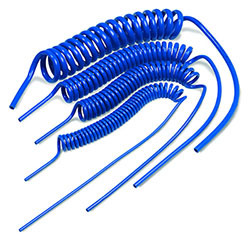 We also have hoses made with FDA-approved, ester-based polyurethane. With an Air Energy-supplied product, you are assured of quality and reliability. Air Energy is a leading provider of “best practice” solutions. 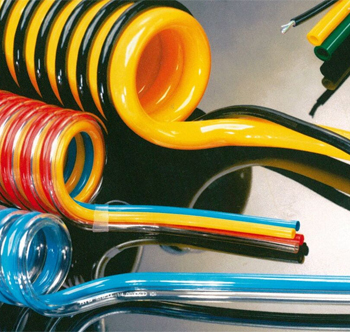 View our types of air compressor hoses below to find the best one for your application. CEJN non-braided hose is an excellent choice for applications requiring a maximum working pressure up to 10 bar (145 psi). It is light and flexible and offers high tensile, tear, and impact strength. The hose easily springs back to its original form. The braided anti-spark PU hose is light and flexible, springing back easily to its original form. With its high impact, tensile and tear strength, it offers superior ageing qualities and long service life. 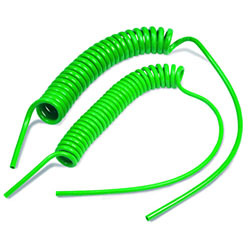 Spiral hose with excellent recoil ability and crimp resistance. It has high tear and tensile strength. It offers resistance to impacts, oils, solvents and aqueous and non-aqueous solutions. The hose is abrasion resistant and is suitable for applications in a wide temperature range. Working pressure 10 bar (145 PSI). Spiral hose resistant to scorching and damage while exposed to sparks in welding or steel cutting environments. This hose has excellent crimp resistance and recoil ability, making it ideal for fixed workplaces and assembly lines. It also offers outstanding resistance to solvents, oils and other non-aqueous solutions. Working pressure of 10 bar (150 PSI). 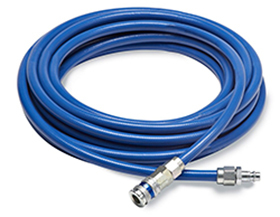 The hose is designed for compressed air and breathing air applications. Each combination features one colored tube, and one transparent tube to allow a visual inspection of the airline for impurities. All configurations are available in both metric and imperial sizes. Imperial lengths from 25 to 100 meters, and metric lengths from 20 to 100 meters. Continuous lengths are not available in all sizes, however, pricing is based on total length. Our 2MP (two tubes) is available in black/light blue. 3MP (three tubes) is standard in black/clear blue/light blue. 4MP (four tubes) is standard in black/clear blue/light blue/clear. The multibore tubing can be easily stripped without damaging the tubing, making it easy to separate and route the tubes to different locations. It is available in a wide range of colour combinations and sizes of bonded tube. Air Energy is committed to providing the air compressing and industrial pipework sectors with high-performance air hoses. Contact us for more information.